In March, Edmonton’s Edmonton Convention Centre played host to one of the largest and most significant events we’ve ever had the pleasure of holding: The National Truth & Reconciliation Commission Hearings. Some 24,000 people attended the four-day event, including 2,800 students from surrounding schools. Meetings overtook every room, nook and cranny on all three levels of the Center. 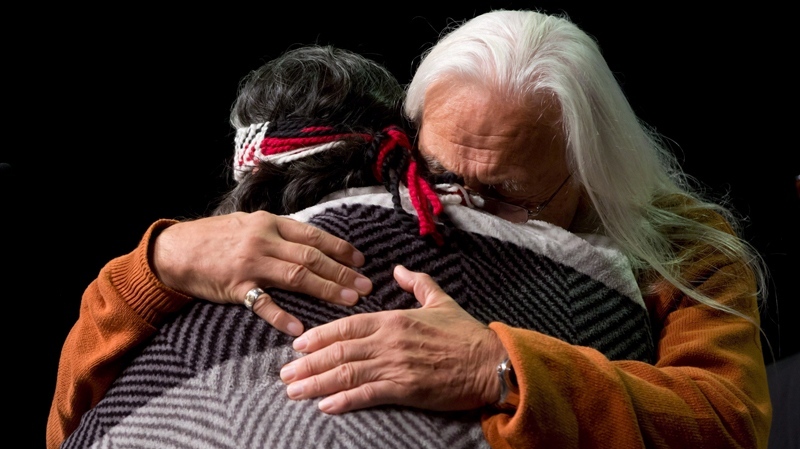 It was a time of discussion, remembrance, mourning and celebration as the injustices of the Indian Residential Schools program were brought to light and a future of progress toward reconciliation was explored. The hearings ran so smoothly, few stopped to think about all the work that had gone on behind the scenes to make them possible. As Marnie Gomes, our Client Event Manager explains, accommodating an event of this size and significance was a unique and challenging task. There were, of course, the usual logistical challenges – from food to feed thousands of hungry guests to meeting spaces that had to be changed on the fly to accommodate the overflowing crowds who wanted to participate. Internally, SCC’s Event Services, Foods & Beverage and Banquet teams were kept busy preparing to host these very special guests – a task made especially difficult with the many last-minute changes. All of this preparation and planning had to be completed in less than 60 days. It was a true team effort. But welcoming the world to our doorstep goes beyond the typical logistical challenges. As a meeting place, we want to be accommodating in every sense of the word. That often requires special considerations for the unique cultures who will take part, and this event was certainly no exception. One of the most important accommodations that needed to be made was putting provisions in place to allow for “Smudging”, a cleansing ritual of immense cultural significance to Canada’s First Nations, Inuit, and Métis people. Smudging involves the burning of herbs and then brushing the strong-smelling smoke over yourself and the room around you in order to heal oneself of bad spirits, negative emotions and destructive energy. Given the nature of the event, smudging was crucial to creating an environment of healing, discussion and release. The Centre was proud to be able to accommodate this ritual, dealing with fire regulations and making special arrangements to allow smudging to take place throughout the entirety of the building. There was also need to create meeting places where First Nations, Inuit, and Métis felt welcome to participate in the celebrations, performances and discussions throughout the event. “One challenge, unique to this event, was finding culturally suitable space for the teepee and the 24-hour fire, while still meeting fire and safety regulations,” shares Marnie. Staff also had to prepare for the emotionally charged nature of the event. All of SCC’s staff went through voluntary trauma training as part of preparing for the Commission Hearings in order to better understand and help those who would be attending. It was a serious eye-opener for everyone involved. Indeed, events like these hearings are steps towards raising awareness and creating change. Even a small glimpse into the stories of hardship and abuse better prepared our staff to welcome, accommodate and support attendees, giving a new perspective into the intense emotional importance of the event. Even amid the heartache, there was joy and celebration. Friends met together, sharing meals, conversations and community – sometimes late into the night. Given the sheer size of the event and the number of people involved, that’s rather remarkable. But even as the tables were packed away and the last few attendees filed out the doors, Marnie’s job was far from over. Change is the only constant for an event manager; another week brings another event with a new dynamic, audience to cater to and accommodations to make ready. There’s hardly a moment to breathe, and it can all feel a bit like herding cats – but in the end, this change is what Marnie loves about her career. With the echoes of the hearings still ringing through our halls, our staff took something new away from the Truth and Reconciliation hearings, and we hope all who attended did as well.